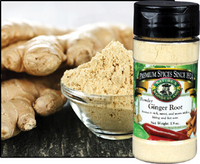 Ginger Root - Powder, 1.9 oz - Penn Herb Co. Ltd. While the sweet-spicy flavor of Ginger is a must for pie spice blends and just about every sweet treat, it is more than a dessert staple! The pungent root adds zing to Asian dishes, Jamaican jerk sauce and Indian curries. What are Ginger cookies without the warm, spicy bite of Ginger? Taste and see for yourself with this old-fashioned Ginger Spice Cookies recipe.